Finally we had made it to the big one. This was the place that Hanna was most looking forward to, mostly because she just wants to run around like a maniac. 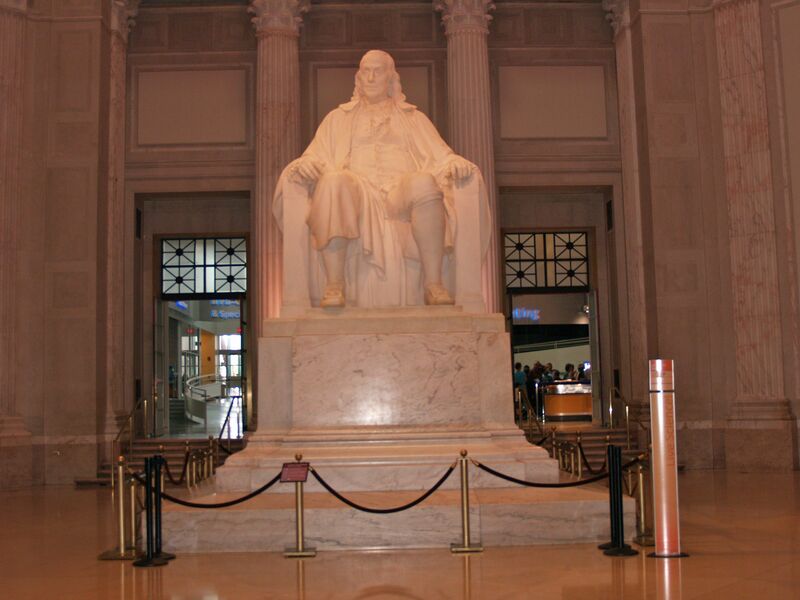 The Franklin Institute is a huge Science museum, and as I’m sure you can guess is named in honor of Benjamin Franklin. 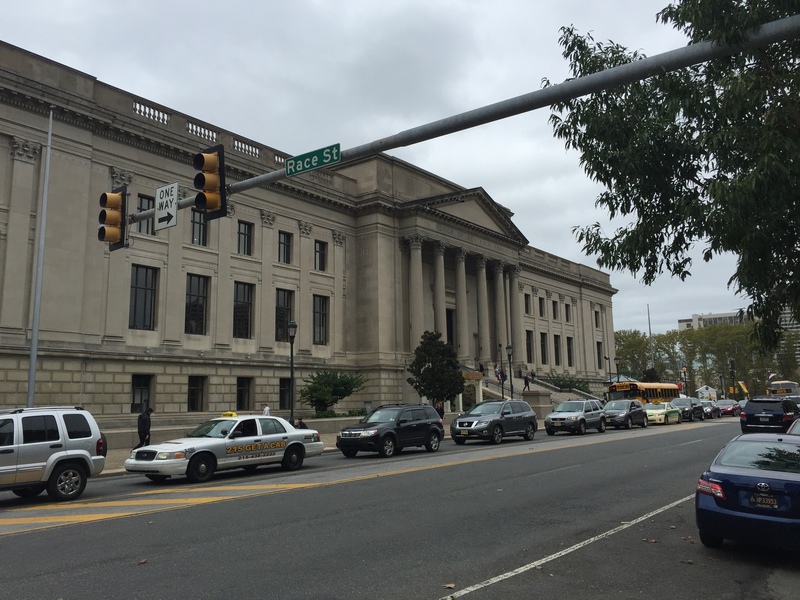 It was founded in 1824 and is one of the oldest centers for science education in the United States. We walked up the big set of stairs on the 20th street entrance and headed inside only to be greeted by Mr. Franklin himself. Unfortunately it was only a huge marble statue but it was still nice to see him. Beyond the statue we entered into the main atrium of the museum where we picked up our tickets, and also found the first set of penny machines. 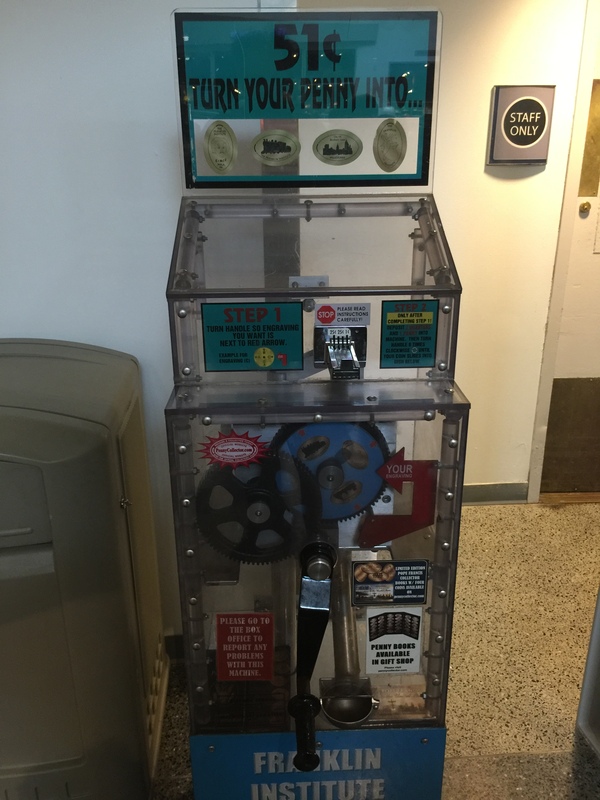 The first machine we found was over by the elevators that took you to the parking garage. However I should mention that this was actually not a penny machine. If you click on the picture above you can view a full size version for more detail. The machine actually had blank medallions that is supplies. 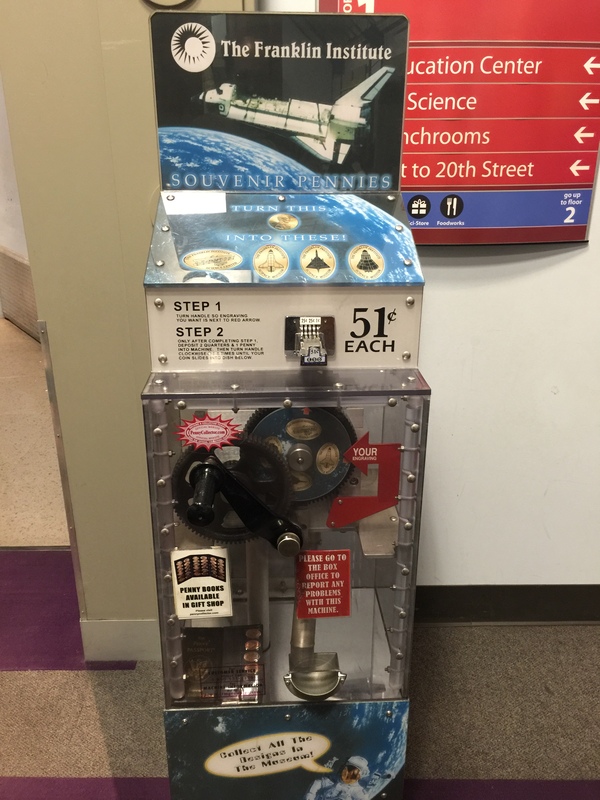 The instructions were pretty simple, use the handle to select the design you want, insert your $1 (per design), and then crank the handle until the pressed medallion dispenses at the bottom. 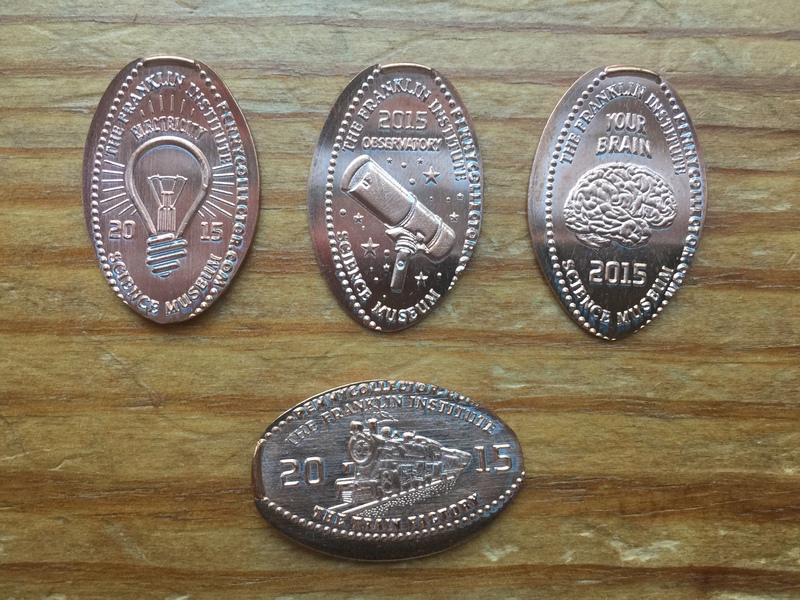 I will say it was nice not having to supply my own coin for once and they came out really bright and shiny. These designs were listed as a limited edition which I would assume is because they listed the year 2015 on each of them. But this also gives me hope that maybe these will be updated each year moving forward (fingers crossed). The designs included: Electricity, Observatory, Your Brain, and The Train Factory. Next we headed over towards the restrooms and found three more machines all right beside each other. I always find when the machines are located near restrooms they are sometimes hard to used with so much traffic and people using them to lean against. There were no different unfortunately but after a few minutes of excusing ourselves Hanna and I were able to press a set of each. The first two machines were separated by a collectible token machine and an ATM machine. They both pressed without any issue and were in nice working condition. The first machine had a plain marquee on the top, but the bottom of the cabinet did have a zoomed in picture of one of the designs. 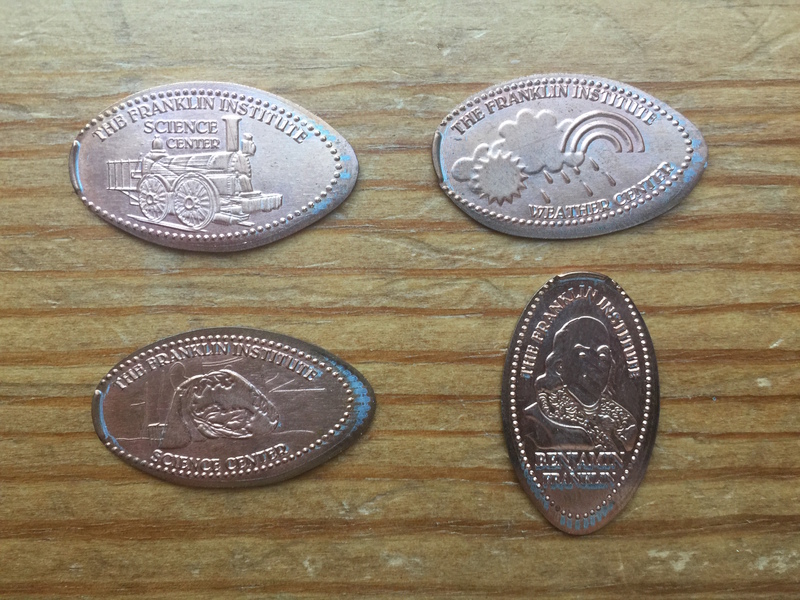 The images on each coin were: Benjamin Franklin, an Old Steam Engine, the Human Heart, and the Weather Center. The next machine as you can see above had a nice American Flag theme to the cabinet. 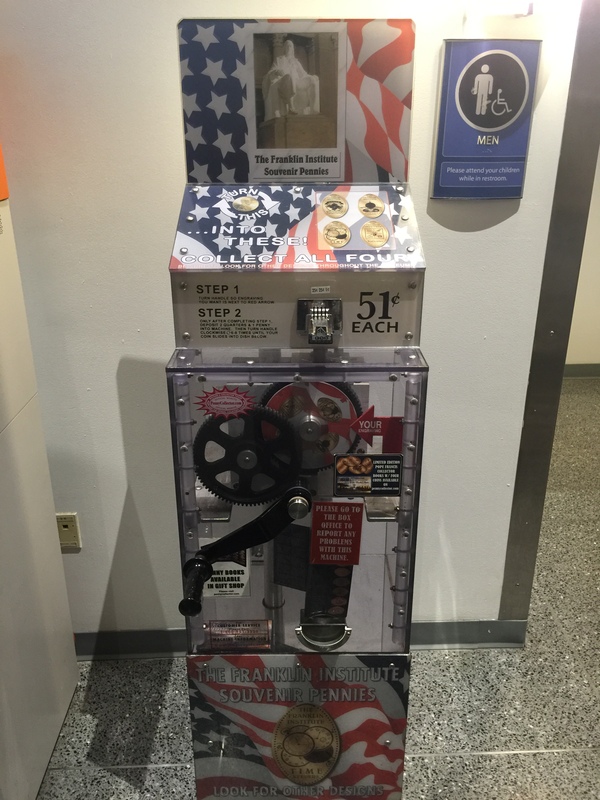 The designs available in this machine were: The Fire Company Union, the Foucault Pendulum, Time Keepers, and the KidScience Logo. A few feet to our left and we found the last machine in this area. This machine also had the plain top marquee with the clear acrylic casing. 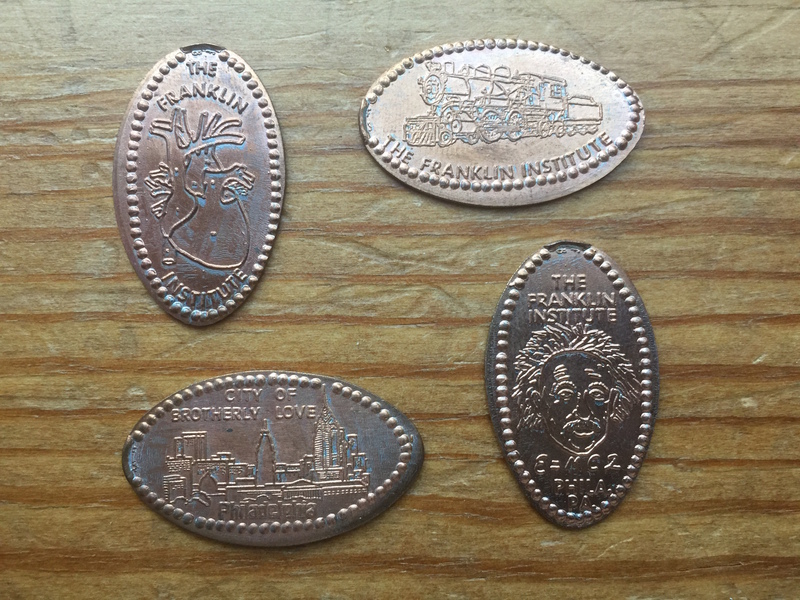 The bottom of the machine did say “Franklin Institute”. This machine had designs of: The Human Heart, A Steam Engine, City of Brotherly Love, and Albert Einstein. Just as a reminder, we hadn’t even gone into the museum exhibit areas yet. All four of these machines were located in the main atrium and no admission was required to get them. However there was one more machine lurking inside that you would need to pay to access. 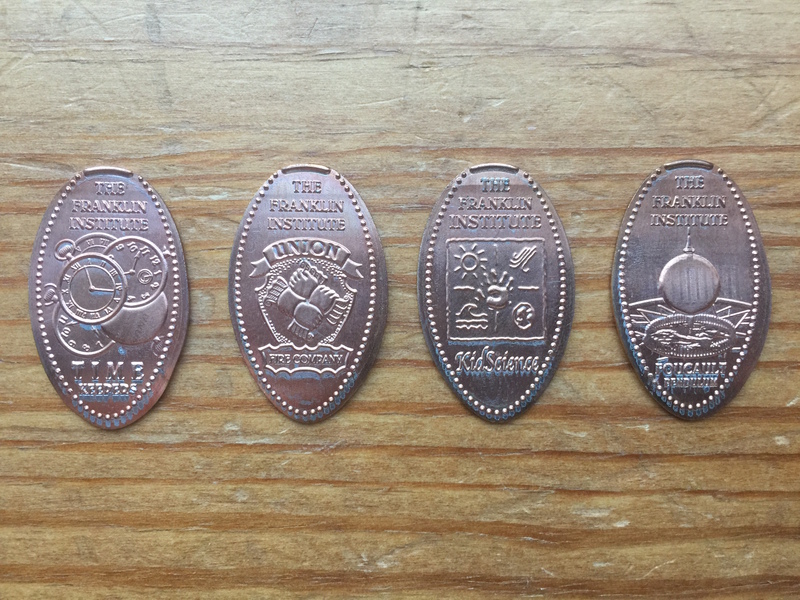 With all the new sets of pennies stashed away we gave the attendant our tickets and headed towards the first set of exhibits. 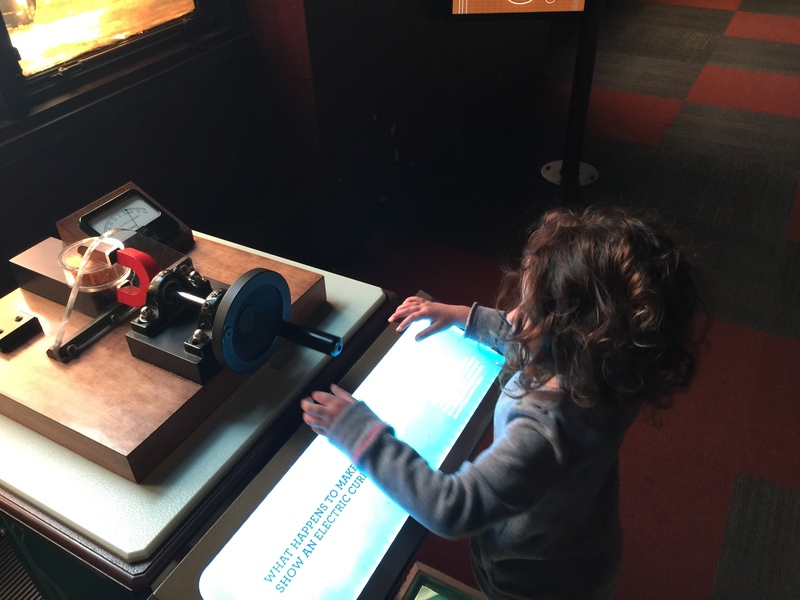 This place is truly a science lovers dream, and has a lot of great interactive things for the kids and adults of all ages to enjoy. 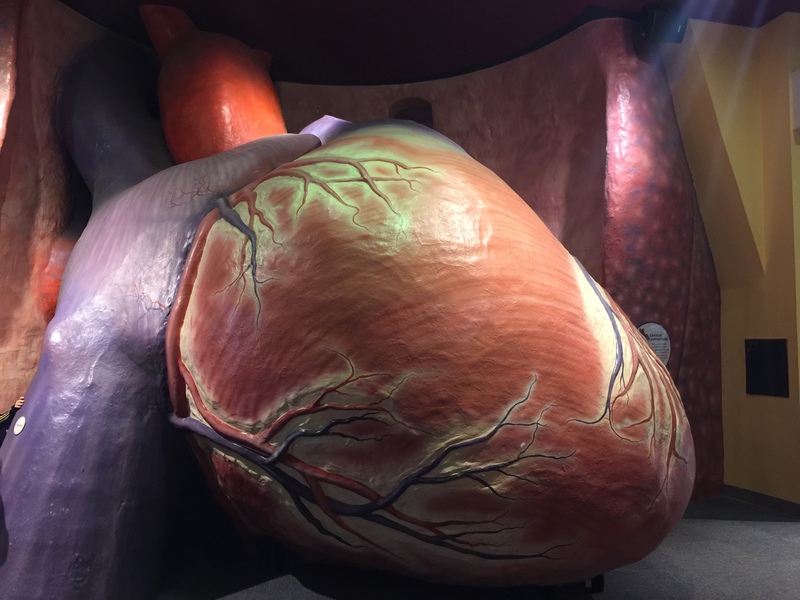 Hanna found the giant human heart that you can walk through all the chambers and follow how blood flows through this amazing muscle. There were sounds effects of blood pumping which Hanna wasn’t a fan of, but was fun walking through and taking in the detail of the model. Eventually we worked our way into the Electricity section of the museum. There were numerous activities helping to explain how electricity works. Hanna had fun turning the handle and watching the light bulb light up. We continued walking around the different areas of the museum and eventually made our way downstairs to the Space Command. For anyone that enjoys outer space and astronauts this area would be for you. 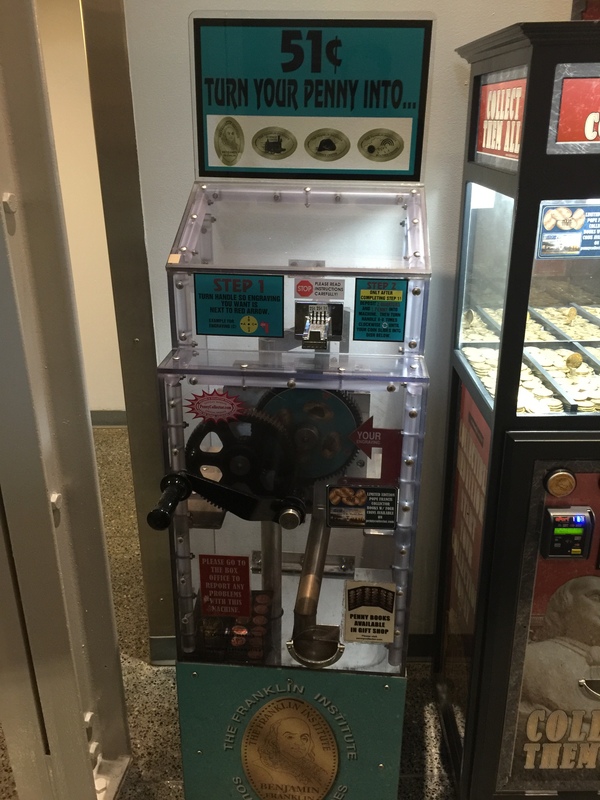 As we rounded a corned to go into the next exhibit area we found the last penny machine. 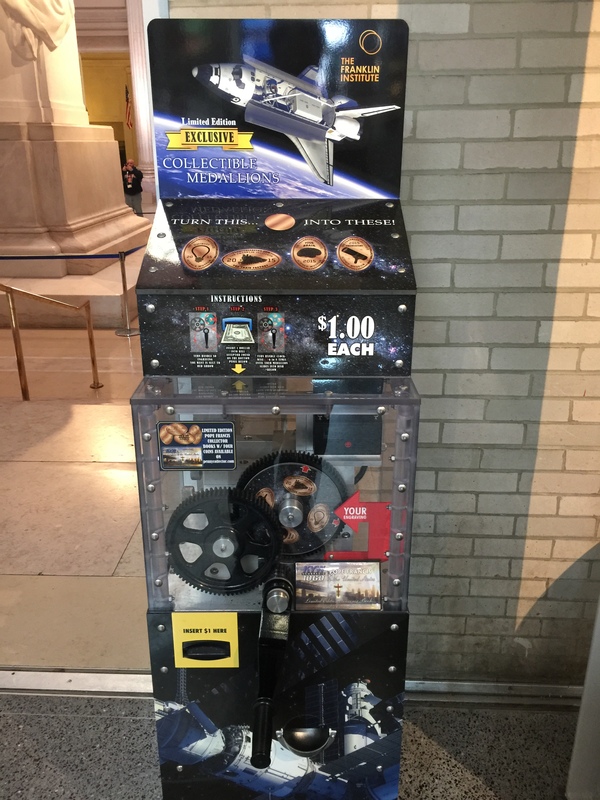 This machine was nicely decorated with a Space themed cabinet, and the four designs were also themed accordingly. 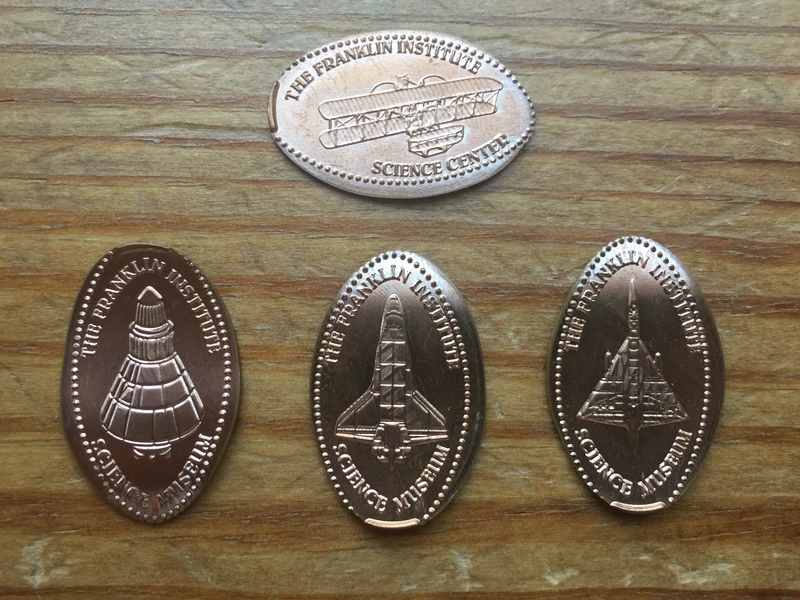 As you can see from the above picture the designs are kind of a history of flight set: A Biplane, Space Module, Space Shuttle and a Delta Wing Jet. After finishing our space mission we headed back upstairs and checked out the last few exhibits. We began packing up all our things and headed outside to start walking back to our car. Hanna was about ready to head home but we still had one last quick stop to make before our day was done.